One of the blogs I like to check regularly is the one written by Lorelei Eurto. She is always finding unusual beads and components to use in her jewelry designs, and she has an amazing eye for creating asymmetrical necklaces. Her pieces are sophisticated and funky with an inspiring sense of playfulness. Lorelei and her fellow jewelry designer Erin Siegel wrote a book, Bohemian-Inspired Jewelry, published in May of this year. It’s full of new ideas for using a variety of beads and fibers in necklaces, bracelets and earrings. I’m happy to have it on my bookshelf, and I find it evocative every time I look at it. Lorelei offered a challenge on her blog last week. 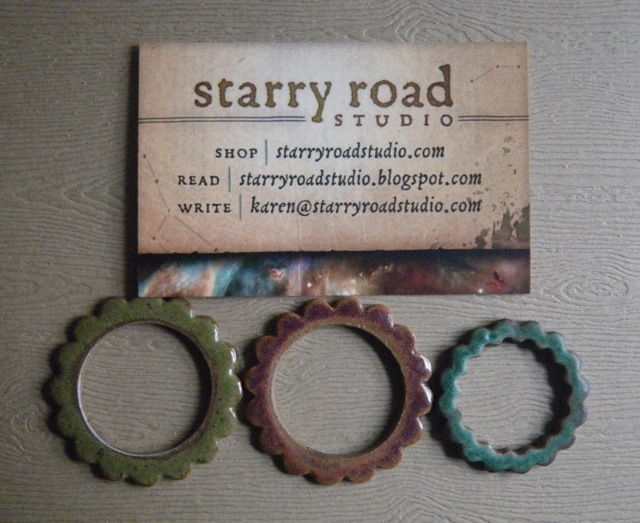 She would randomly select 6 people to receive identical sets of ceramic hoops, generously donated by Karen Totten of Starry Road Studio. All we had to do was leave a comment, and our names would be thrown into the pot. Well, wooty woot! I was one of the 6 people chosen by random! Thanks Lorelei, and thanks Karen. A challenge is just what I need to urge me back into the studio. These cool pieces arrived in the mail on Friday. I have until the reveal date, October 30, to design something new. To think outside the box. I can’t wait to see what we all come up with. oooooooooo! i love those! can’t wait to see what you do with them!!! Aren’t they cool? They’re bigger than I thought they would be. When I got them out today to look at them, I thought of you. The pinky brick color is the first one I’m working with. Surprised I didn’t go right for the green first? What are you gonna do with yours????? 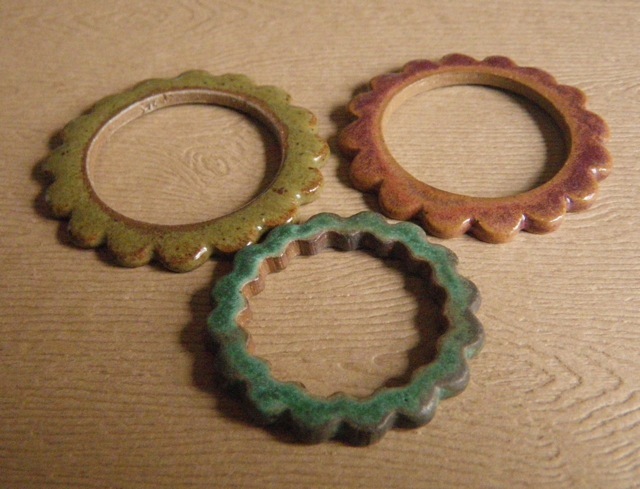 I want to do the traditional thing which to me is connect them with jump rings and make a great necklace…. but we’re not SUPPOSED to do the traditional!!!! I know. I’m thinking of using them as loops and making toggles to go through them for a necklace clasp. But…still thinking about it. I was really happy to see your name there too! !